A 100-level part-time student of a journalism institute, Falope Oluwole, has been arrested by the Lagos State Police Command for allegedly duping no fewer than 33 men. Oluwole, a 22-year-old undergraduate, was alleged to have posted the photo of a United States female makeup artist, Shayla, on his Instagram page, through which he duped the unsuspecting men who asked for a relationship. It was gathered that the suspect’s movement had been monitored by operatives of the Rapid Response Squad for some weeks. He was trailed to a club in Ikeja City Mall where he was arrested eventually on Thursday. 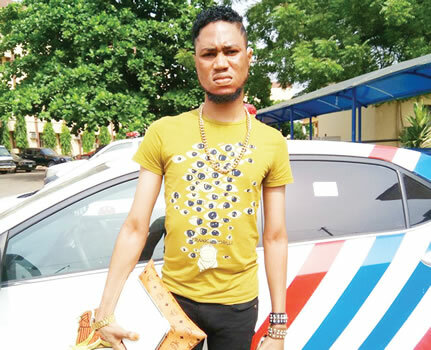 It was gathered that the suspect recently celebrated his birthday at an upscale nightclub in Lekki, Lagos, where he reportedly lavished over N500,000 on food and drinks. A source said Oluwole’s activities on Instagram were placed under investigations when the police received a complaint about an Instagram handle @blackberbiedoll, used for criminal activities, which was later traced to him. The suspect was also reported to have maintained @froshwhite007 and @froshwhite separately on Instagram for the same criminal intent. One of his victims, who identified himself only as Bernard, said he got a friendship request from @blackberbiedoll, adding that he accepted it thinking that a female owned the account. He said, “Apparently, the picture on the account was that of a lady. The lady in question messaged me on BBM. Honestly, I thought I was chatting with a woman who claimed to be in Nigeria at the time. “She lied to me that her father was a Nigerian and her mum, a Kenyan. At a point, she lied that she was building a beauty outfit in the Ikota Shopping Mall, VGC, and that she was in need of some money to complete the mall. Oluwole, in his statement to the police, said he started the fraudulent act about two years ago, adding that he had duped no fewer than 33 men on Instagram. He said the least amount he received from any of his victims was N80,000. He said, “When I started, much as I pretended to be a lady on the phone, some men didn’t believe me. I then downloaded an application on Google store, which transformed my voice into that of a lady whenever I had a conversation. I got several pictures of Shayla, a pretty US lady, on my profile. Since then, men started disturbing me and calling to request a date. “What I do is to assess people based on their appearance on Instagram. I add them and thereafter open up conversations with them before I bring up all kinds of stories to dupe them. At a point, I lied to most of them that I had an accident and I lost my ATM card. I told them that I needed some money. Some of them were generous enough to send money into my account. Investigations revealed that the owner of the pictures the suspect used, @Shayla, had complained to Instagram that some Nigerians were using her photos to scam unsuspecting members of the public. It was also learnt that the suspect claimed to be a friend of Toke Makinwa, Tonto Dike, Don Jazzy, Peter Okoye, among other top celebrities. Our source added that Oluwole’s claim about being a mixed race was also a lie; rather, he bleached his skin. “He admitted bleaching his skin to escape the taunting of girls that he was ugly,” the source said. Items recovered from the suspect included, one iPhone 6, one Samsung Galaxy A5, one Apple tablet, hand and neck chains, some cash and a handbag. The Police Public Relations Officer, SP Dolapo Badmos, warned members of the public to be wary of those they talked to on the social media, saying scammers were on the prowl worldwide. “The suspect has been transferred to the State Criminal Investigation and Intelligence Department for further investigations,” she added.